A wheelchair inclined platform lift or “IPL,” provides unique option for accessibility up and down stairs without having to transfer out of your wheelchair. Inclined platform lifts allow the wheelchair user to drive onto a platform which drives along a track to bring the wheelchair user up and down the stairs with ease. Depending on the model, the platform of the lift may fold up against the wall, or may remain in a fixed position. All inclined platform lifts have the option of a remote “call-send,” which allows the users to remotely call the platform to their landing, or send it to the opposite landing. BILD offers quality IPL systems for both straight staircases through premier manufacturers such as Butler Mobility and Harmar. We use high quality, American made straight stairway inclined platform lift systems, that are customized to individuals and their home configurations. Inclined platform lifts require sufficient head clearance, stairway width, and landing space at the bottom of the stairway. 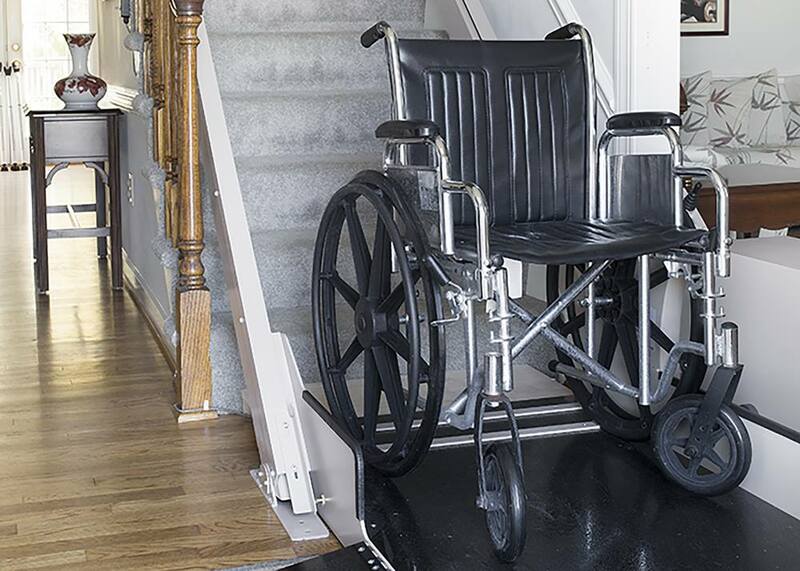 The Butler Mobility Inclined Platform Lift is American Made, and one of the most durable and reliable inclined platform lift systems available. Butler provides a quality American made lift, with a longstanding history of reliability. Beautifully engineered, energy efficient and reliable, the Harmar Sierra provides one of the most affordable and practical inclined platform lifts available. How do I know if an inclined platform lift will work for my home? Inclined platform lifts require sufficient clearances of stairway width, head clearance (typically at the bottom of the stairs), and sufficient landing space at the bottom of the stairs. Our inclined platform lifts are intended for straight stairways only. Our experienced accessibility consultants will come to your home to verify if an inclined platform lift will work for your needs, and explore other stair management options if there is a better alternative. What is the weight capacity of your inclined platform lifts? We carry inclined platform lifts from different manufacturers that go from 500 pound to 750 pound weight capacities. The weight capacity of the lift includes the weight of the wheelchair, and we typically recommend being under the weight rated capacity by 100 pounds. How large is the platform size of an inclined platform lift? Platform sizes will vary depending on the manufacturer and configuration of the inclined platform lift. The width of the platform will be limited by the width of the stairway. The wheelchair width dimension must be verified to fit the landing size, and this should be checked prior to ordering an inclined platform lift. Where do you install inclined platform lifts? We are based in Milwaukee, Wisconsin, and primarily serve the state of Wisconsin and Illinois (including Chicago). We provide sales, installation, preventative maintenance and service calls for inclined platform lifts.